Whether you send a thank you video, a note of gratitude, a welcome gift, a thank you email, or other creative way to thank the donor for their donation, you need to communicate in a specific way to have the biggest impact on your donor. Sending your thanks is a key way to continue developing the relationship with your donor. In fact, with 80% of donors stating a thank you message is the highest motivator for a second gift, properly expressing gratitude is a way to transform your donor file to a healthier one. Most organizations are expending their efforts to focus on new strategies for donor acquisition: how do we convert more donors in our acquisition mailing? What Facebook Ad will result in a new donation? How do we acquire a continuity donor? How do we get more people to click the GIVE NOW button in our latest email? For many organizations, we work so hard to get that first gift and after the donor has given online or sent her check, she hears … nothing. No thank you. No expression of gratitude. No explanation of the impact her gift made. Yes, she might receive an email receipt, but a she doesn’t see that as a heartfelt demonstration of appreciation. The lack of expressing thanks “turns off” the donor and she moves on to give to another organization. Simply thanking the donor is the best way to move the donor along the relationship towards a second gift and ultimately to move your organization into the donor’s top three. Improve your nonprofit fundraising by properly showing appreciate to your donor. In fact, 20-30% of the people who receive your thank you communication will send back a gift. The bounce back gifts can be significant income for your nonprofit organization. We’re not thanking people simply to receive that next gift, but it’s an important part of the donor development process. Once you get people to a second gift, the chance they will continue giving to your organization rises. Like all donor communications, there is a structure for thanking the donor that will have the most impact. First, your communication should be timely. Second, you need to demonstrate impact. Third, you should make the donor feel truly appreciated. Finally, you should focus the communication so it sets the donor up to be the hero. On our one year wedding anniversary, my wife and I pulled out a handful of “thank you” cards that got missed when we sent out the batch from our wedding. We opened each one, wrote a short note of apology about why the card was later, resealed it and sent it. We’re sure the notes were appreciated, mostly due the humor of the situation, but the appreciation was probably missed by the recipients. Likewise, when we’re not timely with our thank you communication, you miss the opportunity to truly demonstrate your appreciation. Even a couple of weeks late will lose the luster of the communication. I recently made a donation to an organization and received my receipt a month later with no real note of gratitude. Receiving the receipt so late focused my attention on the lack of appreciation from the nonprofit organization. You must be timely with your thank you communication. Send your thanks as close to the donation as possible to have the maximum impact. It’s easy to use jargon in our communication or become vague about how the donor is helping. 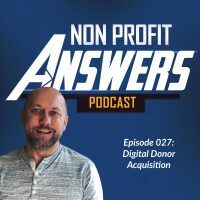 It doesn’t contribute to the donor relationship to tell the donor the gift provided “hope,” you need to be more specific about the impact the donation made. Explaining the impact in the thank you communication helps build trust with the donor that your organization will do good work with the gifts she makes. Tell a story or provide a specific example of how the donor’s gift will be used. For example, “Thank you for your $35 donation to our emergency response fund. Right now, we’re rushing aid to refugees in the Middle East and your gift will help provide emergency supplies, food, and shelter for one family.” You may not be able to specifically tell the donor where her donation will be used, but you can give a general idea of the impact that she made. Show your appreciation in how you thank the donor! This is not a receipt nor should it be a form letter, this needs to be a personalized thank you that demonstrates gratitude for the donation. A donor can smell a cookie cutter message, so design something truly remarkable that sets your nonprofit apart. Don’t be over the top in your thanks in such a way that the donor feels like it’s cheesy or inauthentic. There’s a line between being authentic and kissing up to the donor. We are so appreciative of your gift! We are helping lift people from poverty through our job training programs and placements services. Your gift is making an immediate impact! You are helping lift people from poverty through a job training program and placement service. It’s a small change, but one that pulls the donor into the story to demonstrate the good that she is doing. The donor is giving to you because she has a passion for the cause and you have the ability to impact change. You are the conduit by which she can make a positive impact. Let her feel like she deserves the credit for the good work.